House Minority Leader Nancy Pelosi endorsed Sen. Dianne Feinstein on Monday, calling her fellow San Francisco Democrat "a strong voice and a staunch advocate for the people of California." WASHINGTON (AP) — House Minority Leader Nancy Pelosi endorsed Sen. Dianne Feinstein on Monday, calling her fellow San Francisco Democrat "a strong voice and a staunch advocate for the people of California." Pelosi said Feinstein is uniquely positioned to defend the state against what Pelosi called President Donald Trump's "constant attacks" on health care, immigration and voting rights. Kevin De Leon, president pro tem of the California state Senate, is among several Democrats running against Feinstein, pressing for fiercer resistance to Trump. 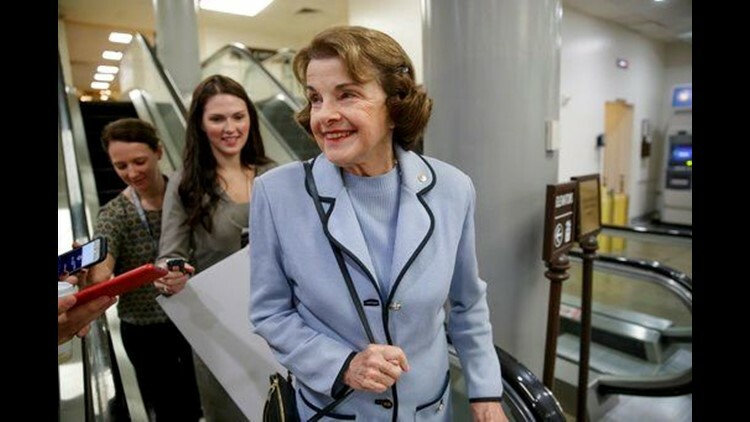 Feinstein, 84, is seeking her fifth full term in the Senate. Pelosi said Feinstein's seniority "is a source of strength to California and is especially needed at this time." California's unusual open primary allows Republicans and moderate Democrats to virtually ensure Feinstein makes the general election ballot against a challenger from the left. The Senate race is being cast as a fight between the moderate Feinstein, who opposes Trump but has supported some of his nominees, and progressive forces who want to aggressively fight Trump's policies across the board. Democrat Hillary Clinton crushed Trump in California's 2016 presidential vote.